Your skin is quite resilient to environmental damage and the aging process. However, over time, your body’s defenses weaken and aging appears in many forms. Typically, the first sign is fine lines. These lines then progress to wrinkles, and, at advanced stages, creases. Your skin loses elasticity, the muscles weaken, and sagging skin and folds arrive on the scene. Chemical Peels are minimally invasive cosmetic treatments that give you leverage in your fight against the aging process. A special combination of chemicals removes the damaged layers of skin and stimulates the growth of new, healthier, more beautiful skin. With proper daily maintenance and protection from sun exposure and other damaging factors, facial peels give you a long-term advantage over aging. Chemical Peels begin with a thorough cleansing of the skin. This allows the chemicals to penetrate the skin. When the skin is clean, chemicals are applied. The type and combination of chemicals is determined by the level of Chemical Peel. The chemicals are left on the skin for a specific amount of time and then removed. An ointment is applied to the skin, followed by a special dressing to protect the skin. As your skin heals, you may experience some swelling and crusting of the skin. You should follow Dr. Maloney’s post-treatment instructions carefully, including the application of ointments, after your facial peel. Your skin may be red and feel sunburned. This is normal and should begin to resolve within 14 days. After one or two weeks, you will begin to see new skin forming that is free of imperfections, lines, and wrinkles. Facial peels are typically not recommended for certain race/ethnicity groups, including Asian and Afro-Caribbean patients. Individuals with pale, freckled skin and red hair typically have more sensitive skin, and facial peels may not be appropriate in these cases. 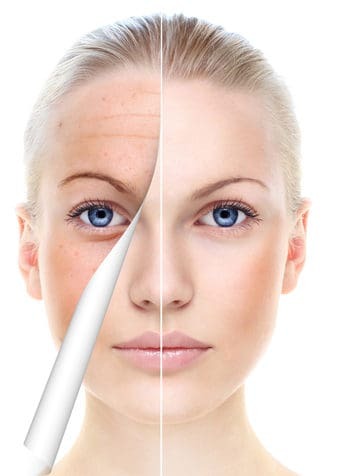 Chemical Peels address some of the most common skin imperfections and signs of aging.